Over the next days and weeks a lot of people will be recounting their memories of Kenny McKinley, and deservedly so. They’ll talk about the slant routes against Tennessee. 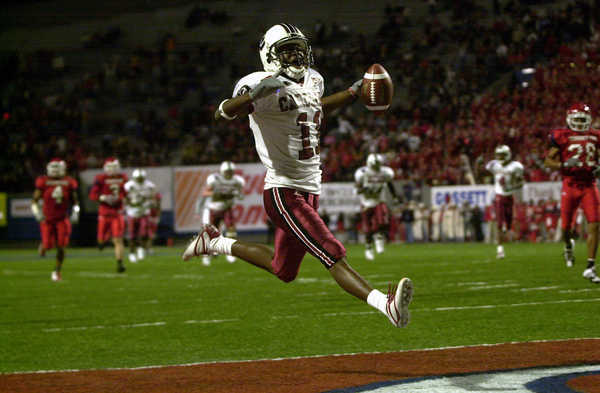 His first career touchdown catch against Arkansas. His touchdown throw to Syvelle Newton against Kentucky. His catch-and-run against Clemson. His two-touchdown performance in the Liberty Bowl…and on and on. But something else came to mind for me. It was the 2006 Clemson game. I know you all remember the play. Carolina was driving for a touchdown late in the first half. But impossibly Jock McKissic, a Clemson defensive lineman, picked off a Blake Mitchell pass and lumbered the other way for a touchdown. Cant’ you just see a kid having that reaction? Then one of the coaches coming over to calm the kid down? As I reflect on Kenny McKinley’s career, I think that play was indicative of the childlike joy and passion with which he played the game. There was an innocence to it that still makes me smile. I bet Kenny saw that replay later and smiled his trademark smile too. Don’t get me wrong, Kenny McKinley was a man on the football field from the first day he suited up at the University of South Carolina. He never played a down of wide receiver until college, but worked his tail off and became, numbers-wise, our greatest ever. No one would’ve batted an eye if this lightly recruited kid had gotten buried on the depth chart and transferred to Furman or Newberry or Hampton. But somehow, against some pretty steep odds, he became an NFL draft pick, and got his name prominently displayed on Williams-Brice Stadium. More than that, he had the undying adoration of the Gamecock Nation. Not just for his catches and yards and touchdowns, but for the way he played. For his joy and innocence. I don’t know when the joy and innocence faded from Kenny McKinley. Maybe it was just the last few days. Maybe it was weeks or months, possibly even years. I honestly don’t want to know any details. I don’t want to think about the unbearable sadness that must’ve consumed him to make him do what he did. As college football fans, we chew players up and spit them out every four years. We recognize them at their last home game, thank them for their service, give them a bouquet of flowers and wish them well. Then we forget about 99% of them. Not because we don’t care or don’t appreciate them, we just don’t have the capacity to remember them. Then there are the 1% that stay with you. The 1% that create the lasting memories. Thank God for that 1%. Thank God for Kenny McKinley.